Planck’s technology enables fully autonomous drone operations from moving vehicles, both offshore and off-road, with minimal installed hardware. The core technology uses artificial intelligence, computer vision, and advanced control systems, all of which have been validated through rigorous field testing. Key technologies include precision launch and landing of small UAVs, real-time object detection and tracking, and real-time image processing tools. Planck Aero’s technology makes it possible to operate autonomously from moving platforms, including precision landing, without the need for dedicated personnel or extensive installed hardware. The sensor-guided flight does not account for motion of a vessel or ground vehicle, including roll, pitch, heave, and wind effects. The precision landing drone technology enables operations from moving ground vehicles, including trucks, as well as small boats and ships at sea. Precision landing drones can be integrated into a wide range of host vehicles without interfering with normal workflow. With centimeter-level accuracy for precision takeoff and landing, the drone can launch and recover reliably from small spaces. The landing pad is passive and no special set-up is required. The precision landing system uses computer vision, artificial intelligence, and other onboard sensors, but does not require GPS or active communications. The precision landing drone system has also been deployed on static platforms for reliable, repeatable flights from unattended locations. Planck provides computer vision capabilities for real-time situational awareness applications. High-performance onboard image processing and a drone neural network are used for object detection, classification, and tracking for on-the-go missions. The drone neural network detects humans, vehicles, whales, other marine mammals, and many other objects on or near the surface of the water, as well as diverse terrain. Imagery and detected objects are geo-referenced for precise location, both over water and land. High resolution imagery and video is processed onboard and can be used for closed-loop control to track objects of interest, and relay the most important data to remote users. Planck builds highly autonomous unmanned aircraft systems for real-time situational awareness applications. 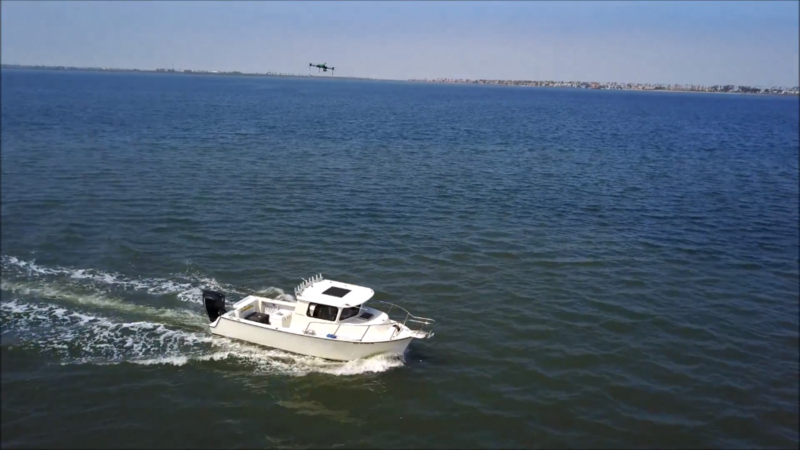 In order to operate from moving boats and trucks, the drone autonomy must be robust, reliable, and well tested. Whether it be offshore or off-road, Planck’s drone autonomy solutions are intelligent enough that they can operate with minimal setup and without a skilled pilot in the loop. Precision landing is just the beginning. Full drone autonomy from moving vehicles includes relative navigation, path planning, terrain awareness, closed-loop control, automatic secure and releasing, and data networking. It also requires deep understanding of customer missions. Waterstitch™ software that generates geo-referenced orthomosaic maps over the surface of the water. The software intelligently selects and merges the best pixels from overlapping sets of images so that you can see the big picture of the water surface. The real-time orthomosaic over water software has been used for oil spill response as well as to map the location of leaking oil wells below the surface. Many features that are difficult to spot in individual images, such as oil sheen, become clear after stitching hundreds of images of the water surface together. Waterstitch™ does this, and generates large maps in a range of geospatial file formats. Contact us for more information on how Planck Aerosystems drone technology can benefit your business.